The province of Carolina and especially the Colony of South Carolina had English settlers from Barbados in the 1660s and French Huguenots. There were concerns of the French and Spanish at different times in Florida pushing the Roman Catholic faith up the east coast. In studying South Carolina genealogy, it is noted that to help attract new settlers to the new colony, the English encouraged religious freedom especially to Quakers, Baptists and Presbyterians. Even Jewish immigration was specifically encouraged as they were seen as reliable citizens, good traders and businessmen. By 1800, Charleston had the largest Jewish population in the United States. Also, coming in the South Carolina colony were Africans, some as indentured servants at first, but later mostly as slaves. Between 1670 and 1717, the British traders of South Carolina conducted an immense trade in Native Indian slaves, many coming from further west by the Mississippi River and Tennessee areas. Some 24,000 to 51,000 Indian slaves were exported during this period to Boston and into the Caribbean. 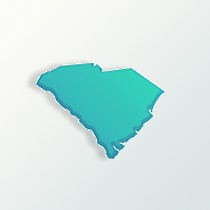 By 1719 South Carolina becomes a royal colony of England. From then on South Carolina colonists turned to using exclusively African slaves for labor for their new commodity crops of rice and indigo. The low country, along the coast, was dominated by wealthy English men who became owners of large amounts of land on which they created plantations. The lands were rich and the climate good, making South Carolina one of the wealthiest colonies. Examining South Carolina genealogy it is noted that in the 1700s more migrates from Pennsylvania and Virginia were of English and Scots-Irish descent. The relocated in the Upcountry or Backcountry section of South Carolina. Also, immigrants from Ulster, the Scottish lowlands and the northern end of England (the border counties) comprised the largest group from the British Isles before the American Revolution settled in South Carolina. These people relied on subsistence farming and rarely owned slaves. Given the differences in their backgrounds, class, slave-holding, economics and culture, there was longstanding competition between the wealthy of the Low Country and original folks in the Upcountry. South Carolina declared independence from Great Britain and set up its state government on March 15, 1776. Because of the colony’s longstanding trade with Great Britain, the Low Country cities had numerous Loyalists, those in support of England. While the colonists were fighting for independence, about 25,000 slaves escaped, migrated or died during the disruption of the war, which represented about 30 percent of the state’s slave population. About 13,000 joined the British side, who had promised them freedom if they fought with them. From 1770 to 1790, the proportion of the state’s population made up of African-Americans slaves dropped from 60 percent to 44 percent. The Scots-Irish in the Backcountry were the strongest patriots in the War for Independence. Opposite of the support were a large group of immigrants from Northern Ireland who did remain loyal to the English. The whole area came together after the war as their ratify the new U. S. Constitution. Going into the 19th century, many of South Carolina’s plantation owners played the role of English aristocrats more than the planters of other states. The minority population for the whole state was white Europeans and they control the government and economic power. The majority of the population in South Carolina was black. In 1860 the population of the state was 703,620 with 402,000 labeled as African-American slaves. There were only about 10,000 free blacks. During the 1830s and 1840 many of the white residents were against the abolitionist movement. Conditions and attitudes did not improve over the years. South Carolina was the first state to vote to secede from the Union in 1861 and became the founding state of the Confederacy. The Civil War proved to be a disaster for South Carolina. Poverty marked the state for generations to come. With major changes in the labor market, agriculture suffered. Racial and economic tensions continued for decades. Also, proportionally South Carolina lost more of its young white men of fighting age than did any other Southern state. In the beginning of the 20th century, South Carolina developed a thriving textile industry. The state also converted its agricultural base from cotton to more profitable crops, attracted large military bases, and created tourism industries. By 1900 the state’s population climbed to 1.3 million. In 1950 the state had 2.1 million and in 2009 the state has 4.5 million residents. Approximately 69 percent of the population are of European backgrounds and 29 percent are African-Americans. Those of European descents are mostly English and Scots-Irish at 20 percent, German descent at 8 percent and Irish at 8 percent. A growing number of Hispanic descent are now living in South Carolina and represent 3 percent. Those following various Protestant religions make up 84 percent. The once large Jewish population has declined over the centuries, now only presenting about 1 percent of the South Carolina’s population.